🌳But, first of all What is Permaculture? 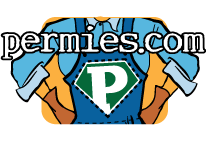 And the permaculture design course is the course that creates the certified permaculturists. During the course, we will be discussing about the current socio environmental crisis and the possible solutions, starting from an understanding of the functioning of natural systems, patterns of nature, bio-construction, water management, successive agroforestry, food ecological and solidarity economy. Sociocracy is a governance system designed to protect and apply the values that democracies cherish. Unlike current democracies, it is also a governance structure designed to make sure those values will be applied as equally as possible for everyone. It is both a social ideal that values equality and the rights of people to decide the conditions under which they live and work, and an effective method of organizing collaborative and productive organizations as associations, businesses, and governments, large and small. 📖The New School Permaculture is a non formal school with the vision to create harmonious social and ecological learning environments. Our Mission is to focus our energy on researching and developing sustainable educational methods to inspire active elements of change in this world. The intention with our courses is to empower our students so that they become more connected with their dreams and passions and more aware about how to create beneficial connections that will contribute to our local and global dreams. With landscape care and social harmony environment we will explore with the students how can we create more inner power to face the global challenges, what are our limiting patterns and how to create a transformation wen we are losing our personal energy, into a more inspired and positive way of living. The course is presented by creative non formal education methods, that are based on creating a bridge between the right and left side of the brain, so that the analytical and creative abilities of the students get fully stimulated and get the most out of the experience. For many people who took the course with us it is being the most empowering and inspiring transformative process of their lives!. ➳ In this course you will have the chance to answer questions like this ones:! I see myself living with a community that works together. Whatever your plans for the future are, the Sociocracy Course, the Permaculture Design Course and the Food Forest Course will give you the perspective and tools required to find positive solutions towards a sustainable life that creates abundance for all organisms and natural systems. Helder studied and worked with pioneers like Bill Mollison and geoff lawton in Turkey, Doug Bullock in the Amazon, Rosemary Morrow in Austria, Graham Bell in Scotland, Darren dougherty, Ernst Gotcsh, sepp holzer in Portugal and many others in countries like Haiti, Canada, Egipt, Finland, Peru, always learning and practicing this sustainable design methods. While living in the city he dedicated 5 years on developing urban permaculture projects and for the last 5 years traveling and developing permaculture institutes around the world. 🌄Where will the course be? This course will be in the beautiful subtropical island of S. Miguel. It has amazing microclimates, you can find plants from cold climates like chestnuts or rhubarb with tropical fruits like mangoes or pineaples all growing very close. Following and Sharing is caring! May the force of collaboration be our guide! For people that complete the 2 courses there will be access to the Permaculture Intensive Internship certificate! But, First of all What is Permaculture? And the Permaculture Design Course is the course that creates the certified permaculturists. Many people practice permaculture in an intuitive way with wonderful results, on this course we will learn about the thinking system of permaculture, the way we look at things, so this course has the objective of changing the way we look at the world, that's why for many people its a life changing experience. The course is presented by creative non formal education methods, that are based on creating a bridge between the right and left side of the brain, so that the analytical and creative abilities of the students get fully stimulated and get the most out of the experience...for many people is the most empowering and inspiring transformative process of their lives...and they carry this with them everywhere they go....and that's our main goal. Whatever your plans for the future are, the Permaculture Design Course and the Social Permaculture Course will give you the perspective and tools required to find positive solutions towards a sustainable life....that creates abundance for all organisms and natural systems. By December 2012 in the Peruvian Amazon working in support to the shipibo indigenous communities Helder created the New School Permaculture and is now developing alternative educational methods. In 2013 the New School has been presenting at the IPC International Permaculture congress in Cuba and sharing experience about ecosocial regeneration. Course will be at tlandhuis Ghent, Belgium! And the PSC Permaculture Social Course from 3 to 7SeP 2018! --> The PDC is the course that creates the certified permaculturists, many people practice permaculture in an intuitive way with wonderfull results, on this course we learn about the thinking of permaculture, the way we look at things, so this course has the objective of changing the way we look at the world, thats why for many people its a life changing experience. 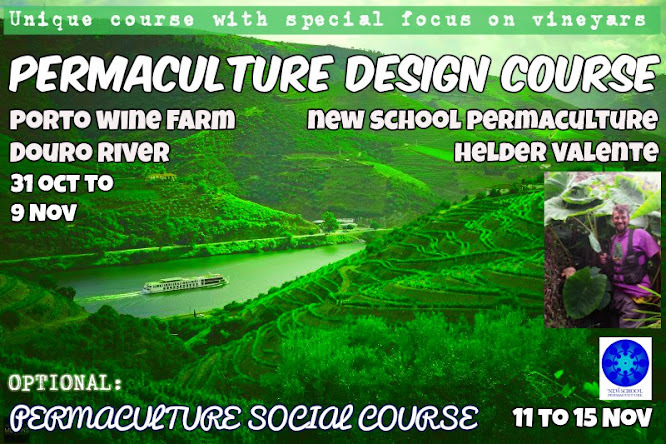 --> The courses will be teach by Helder Valente and the New School Permaculture Team. Check here where we will be meeting to have this amazing experience! This course is for empowering people that want to become permaculture teachers. teaching strategies under our supervision and support. Thic course will be on a more than 40Ha Porto wine farm on the margins of the Douro River. 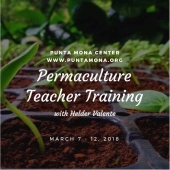 On this course we will cover the same topics covered on the conventional PDC with an extra atention on how to keep vineyars with the permaculture way of thinking. he course is presented by creative non formal education methods, that are based on creating a bridge between the right and left side of the brain, so that the analytical and creative abilities of the students get fully stimulated and get the most out of the experience...for many people is the most empowering and inspiring transformative process of their lives...and they carry this with them every were they go....and thats our goal.